Chi-squared distribution, showing χ2 on the x-axis and p-value on the y-axis. In the 19th century, statistical analytical methods were mainly applied in biological data analysis and it was customary for researchers to assume that observations followed a normal distribution, such as Sir George Airy and Professor Merriman, whose works were criticized by Karl Pearson in his 1900 paper. Until the end of 19th century, Pearson noticed the existence of significant skewness within some biological observations. In order to model the observations regardless of being normal or skewed, Pearson, in a series of articles published from 1893 to 1916, devised the Pearson distribution, a family of continuous probability distributions, which includes the normal distribution and many skewed distributions, and proposed a method of statistical analysis consisting of using the Pearson distribution to model the observation and performing the test of goodness of fit to determine how well the model and the observation really fit. In 1900, Pearson published a paper on the χ2 test which is considered to be one of the foundations of modern statistics. In this paper, Pearson investigated the test of goodness of fit. Pearson proposed that, under the circumstance of the null hypothesis being correct, as n → ∞ the limiting distribution of the quantity given below is the χ2 distribution. 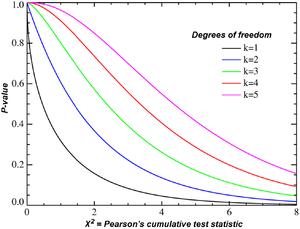 Pearson dealt first with the case in which the expected numbers mi are large enough known numbers in all cells assuming every xi may be taken as normally distributed, and reached the result that, in the limit as n becomes large, X2 follows the χ2 distribution with k − 1 degrees of freedom. will usually be positive and small enough to be omitted. In a conclusion, Pearson argued that if we regarded X′2 as also distributed as χ2 distribution with k − 1 degrees of freedom, the error in this approximation would not affect practical decisions. This conclusion caused some controversy in practical applications and was not settled for 20 years until Fisher's 1922 and 1924 papers. For an exact test used in place of the 2 x 2 chi-squared test for independence, see Fisher's exact test. For an exact test used in place of the 2 x 1 chi-squared test for goodness of fit, see Binomial test. Likelihood-ratio tests in general statistical modelling, for testing whether there is evidence of the need to move from a simple model to a more complicated one (where the simple model is nested within the complicated one). Using the chi-squared distribution to interpret Pearson's chi-squared statistic requires one to assume that the discrete probability of observed binomial frequencies in the table can be approximated by the continuous chi-squared distribution. This assumption is not quite correct and introduces some error. To reduce the error in approximation, Frank Yates suggested a correction for continuity that adjusts the formula for Pearson's chi-squared test by subtracting 0.5 from the absolute difference between each observed value and its expected value in a 2 × 2 contingency table. This reduces the chi-squared value obtained and thus increases its p-value. If a sample of size n is taken from a population having a normal distribution, then there is a result (see distribution of the sample variance) which allows a test to be made of whether the variance of the population has a pre-determined value. For example, a manufacturing process might have been in stable condition for a long period, allowing a value for the variance to be determined essentially without error. Suppose that a variant of the process is being tested, giving rise to a small sample of n product items whose variation is to be tested. The test statistic T in this instance could be set to be the sum of squares about the sample mean, divided by the nominal value for the variance (i.e. the value to be tested as holding). Then T has a chi-squared distribution with n − 1 degrees of freedom. For example, if the sample size is 21, the acceptance region for T with a significance level of 5% is between 9.59 and 34.17. If the test statistic is improbably large according to that chi-squared distribution, then one rejects the null hypothesis of independence. A related issue is a test of homogeneity. Suppose that instead of giving every resident of each of the four neighborhoods an equal chance of inclusion in the sample, we decide in advance how many residents of each neighborhood to include. Then each resident has the same chance of being chosen as do all residents of the same neighborhood, but residents of different neighborhoods would have different probabilities of being chosen if the four sample sizes are not proportional to the populations of the four neighborhoods. In such a case, we would be testing "homogeneity" rather than "independence". The question is whether the proportions of blue-collar, white-collar, and no-collar workers in the four neighborhoods are the same. However, the test is done in the same way. In cryptanalysis, chi-squared test is used to compare the distribution of plaintext and (possibly) decrypted ciphertext. The lowest value of the test means that the decryption was successful with high probability. This method can be generalized for solving modern cryptographic problems. In bioinformatics, chi-squared test is used to compare the distribution of certain properties of genes (e.g., genomic content, mutation rate, interaction network clustering, etc.) belonging to different categories (e.g., disease genes, essential genes, genes on a certain chromosome etc.). ^ a b Pearson, Karl (1900). "On the criterion that a given system of deviations from the probable in the case of a correlated system of variables is such that it can be reasonably supposed to have arisen from random sampling" (PDF). Philosophical Magazine. Series 5. 50: 157–175. doi:10.1080/14786440009463897. ^ Pearson, Karl (1893). "Contributions to the mathematical theory of evolution [abstract]". Proceedings of the Royal Society. 54: 329–333. doi:10.1098/rspl.1893.0079. JSTOR 115538. ^ Pearson, Karl (1895). "Contributions to the mathematical theory of evolution, II: Skew variation in homogeneous material". Philosophical Transactions of the Royal Society. 186: 343–414. Bibcode:1895RSPTA.186..343P. doi:10.1098/rsta.1895.0010. JSTOR 90649. ^ Pearson, Karl (1901). "Mathematical contributions to the theory of evolution, X: Supplement to a memoir on skew variation". Philosophical Transactions of the Royal Society A. 197: 443–459. Bibcode:1901RSPTA.197..443P. doi:10.1098/rsta.1901.0023. JSTOR 90841. ^ Pearson, Karl (1916). "Mathematical contributions to the theory of evolution, XIX: Second supplement to a memoir on skew variation". Philosophical Transactions of the Royal Society A. 216: 429–457. Bibcode:1916RSPTA.216..429P. doi:10.1098/rsta.1916.0009. JSTOR 91092. ^ Cochran, William G. (1952). "The Chi-square Test of Goodness of Fit". The Annals of Mathematical Statistics. 23: 315–345. doi:10.1214/aoms/1177729380. JSTOR 2236678. ^ Fisher, Ronald A. (1922). "On the Interpretation of chi-squared from Contingency Tables, and the Calculation of P". Journal of the Royal Statistical Society. 85: 87–94. doi:10.2307/2340521. JSTOR 2340521. ^ Fisher, Ronald A. (1924). "The Conditions Under Which chi-squared Measures the Discrepancey Between Observation and Hypothesis". Journal of the Royal Statistical Society. 87: 442–450. JSTOR 2341149. ^ Yates, Frank (1934). "Contingency table involving small numbers and the χ2 test". Supplement to the Journal of the Royal Statistical Society. 1 (2): 217–235. JSTOR 2983604. ^ "Chi-squared Statistic". Practical Cryptography. Retrieved 18 February 2015. ^ "Using Chi Squared to Crack Codes". IB Maths Resources. British International School Phuket. ^ Ryabko, B. Ya. ; Stognienko, V. S.; Shokin, Yu. I. (2004). "A new test for randomness and its application to some cryptographic problems" (PDF). Journal of Statistical Planning and Inference. 123: 365–376. doi:10.1016/s0378-3758(03)00149-6. Retrieved 18 February 2015. ^ Feldman, I.; Rzhetsky, A.; Vitkup, D. (2008). "Network properties of genes harboring inherited disease mutations". PNAS. 105 (11): 4323–432. Bibcode:2008PNAS..105.4323F. doi:10.1073/pnas.0701722105. PMC 2393821. Retrieved 29 June 2018. ^ "chi-square-tests" (PDF). Retrieved 29 June 2018. Weisstein, Eric W. "Chi-Squared Test". MathWorld.